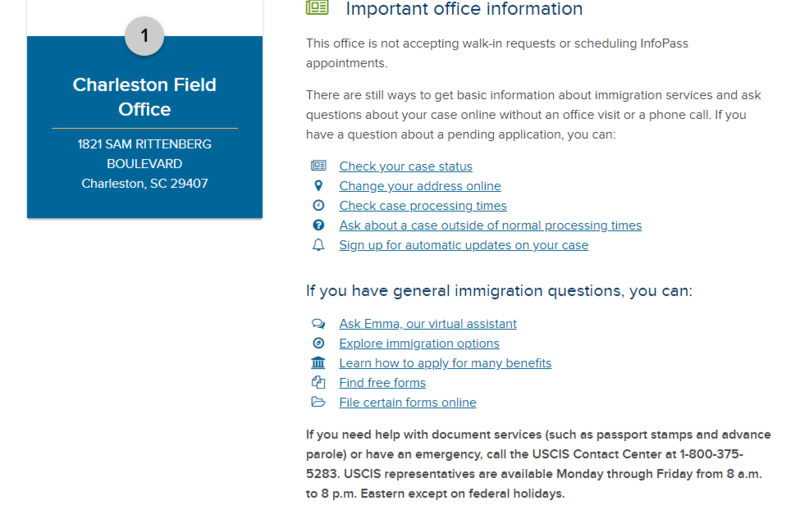 This is the new process for appointments that is rolling out to all field offices. You have to call for an appointment now. It has nothing to do with the government shutdown. It's just something they don't do anymore. Oh ok. Thank you so much. I will call early in the morning tomorrow. Pretty much they don't want people to go to the office anymore without an actual emergency that they could have resolved on the phone. So if the phone can't fix it. They will schedule you an appointment. Be prepared t be turned away even if you have an emergency. My husband's Green Card went missing. We have no explanation as to what happened. We tore the house apart looking. Looked in the car, everywhere. He is flying Friday. We discovered the missing card last Friday evening, too late to talk to anyone. So this morning we hopped in the car and drove to Milwaukee. His friend was able to get a stamp in his passport last year as a walk-in, so we should be good, right? WRONG!!! Call the number, they said, so we called, was on hold for 30 minutes. The girl asked if we filed an I-90 and paid the fee. Not yet...no help. Go do it. They won't even talk to you. "But we are here in the Field Office lobby" doesn't matter. So we went out the the car and we used the app on his smartphone to file and pay. Got a confirmation number. Called back. Waited another 30 minutes. Finally got someone, gave the confirmation number and explained the situation, explained that it's an emergency. She told us he will get a call in 24 to 48 hours and they will tell him what to do. We can certainly understand them wanting people to use the website because many things can be done online, but to make a long bunch of red tape just to get emergency help is nerve wracking. My husband needs to get his citizenship, yes. That will be next, but I just wanted to share this experience so you know what to expect.